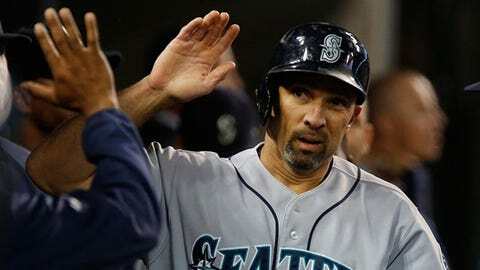 Raul Ibanez, 41, batted .242 with 29 home runs for Seattle last season. The Angels have agreed to terms with Raul Ibanez on a one-year contract to be their designated hitter. The contract would be worth $2.75 million, with incentive bonuses that could increase the value to $5 million. There would be no option year in the contract. The signing would leave the Angels with one major item on their winter shopping list: a veteran starting pitcher. The team appears to have about $13 million to $15 million under the luxury-tax limit — incentive payments count toward a luxury-tax bill — which should allow them to be competitive in bidding for Matt Garza and Masahiro Tanaka, assuming Tanaka becomes available. Assuming Ibanez passes his physical, he would replace Mark Trumbo as the Angels’ designated hitter. The Angels traded Trumbo to the Arizona Diamondbacks last week. Ibanez, 41, batted .242 with 29 home runs for the Seattle Mariners last season. The Angels clearly are betting that his second-half fade was not a result of age. He hit .267 with 24 home runs in the first half, .203 with five home runs in the second half. Ibanez is a career .349 hitter in Anaheim, with 10 home runs in 79 games and a .929 OPS. He won’t be the oldest player in the American League next season. Jason Giambi of the Cleveland Indians is seven months older.